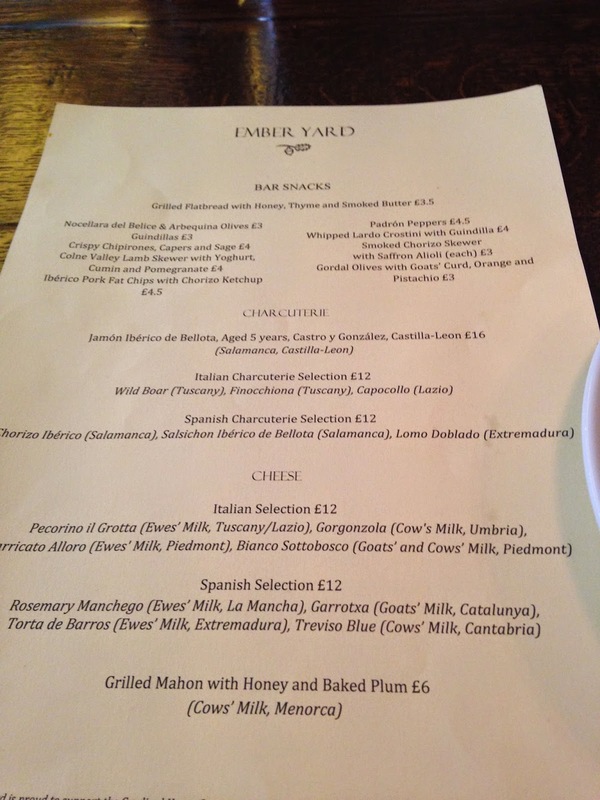 A very, very long time ago I went to a Tapas restaurant called Embers Yard, it was so long ago that it was even pretty sunny that day and I feel pretty bad about leaving it this long. I just want to say first off that you should take what I say on here with a pinch of salt as I don’t think I gave it the best chance. 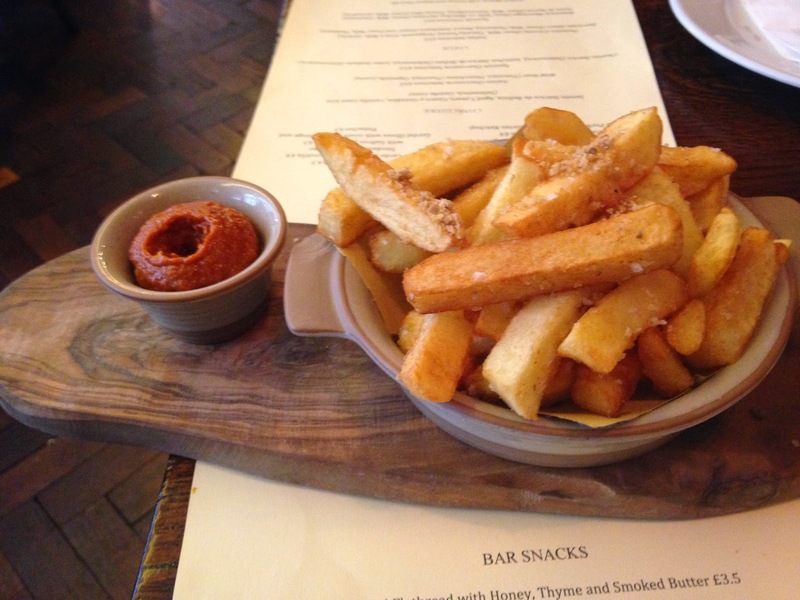 We went a bit too early to get the proper tapas so instead we had the bar food, which to be honest was the side of the menu I preferred, if I could be bothered I would go back to try the other side and give Embers Yard a fair try…but I can’t. Embers Yard is located a couple streets down from Soho Square off Tottenham Court Road and its really nice inside, there were a lot of staff, we got asked three times if we had been seen while the first lady went off to look at the reservations while all but one big table were free. 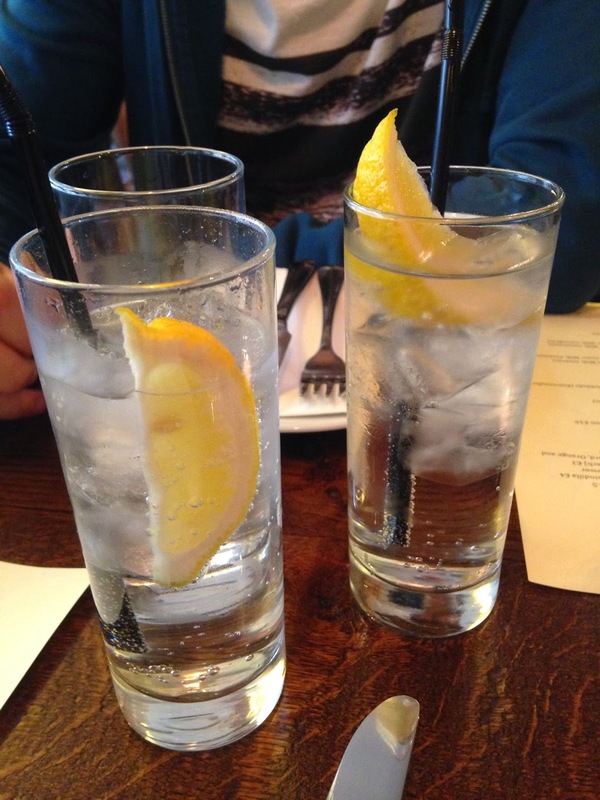 We easily got lemonades for drinks and then placed our order for the bar food choices. 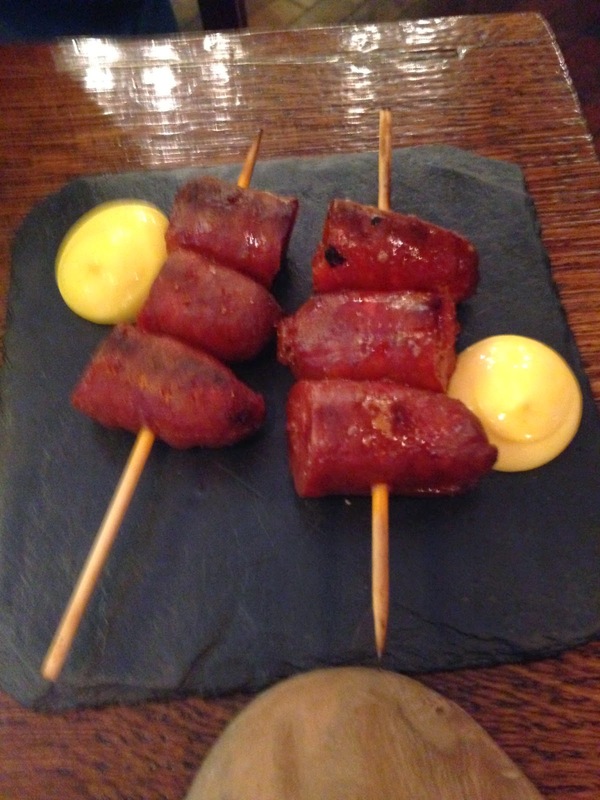 We got two smoked chorizo skewers with saffron alioli they were soooooo tasty really smoky and deep in flavour and went so well with the alioli which I was dipping everything in. 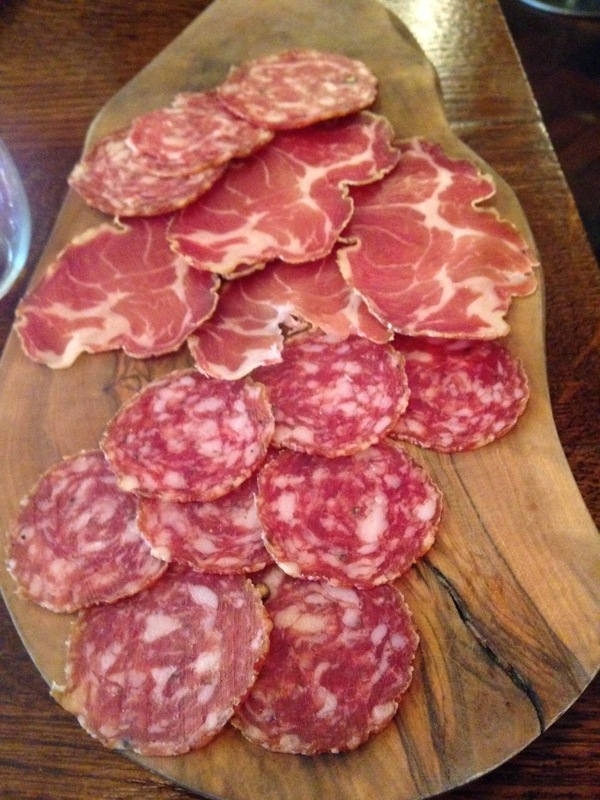 We also went for the Italian Charcuterie which had Wild boar, finocchiona and capocollo all very tasty. The boar got a bit much towards the end and I had to eat it with other things but the whole meat board was such a novelty, I hardly ever get salami etc but I absolutely love them. 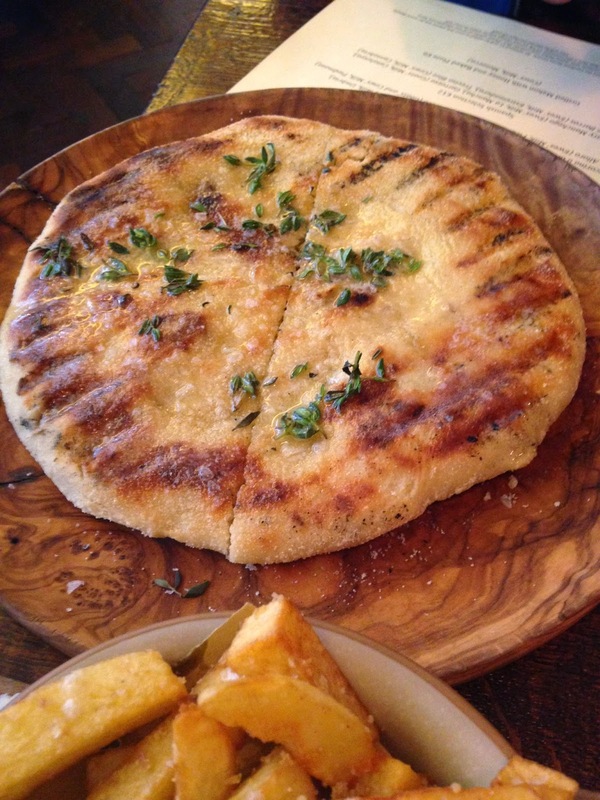 We also got the Grilled flatbread with honey, thyme and smoked butter. Loved the thyme and smoked butter but I didn’t get any honey and I actually prefer the flatbreads I make at home using this recipe from Sunday Brunch they are a bit lighter and softer and again the flatbread got a bit too much towards the end. Thinking back on it all the food was lovely separately but a bit too much together, I don’t know whether we made some bad choices and if the proper kitchen menu had items that would have balanced it out but it hasn’t hooked me in to go back and find out. Anyone else been to Embers Yard and had a better experience?